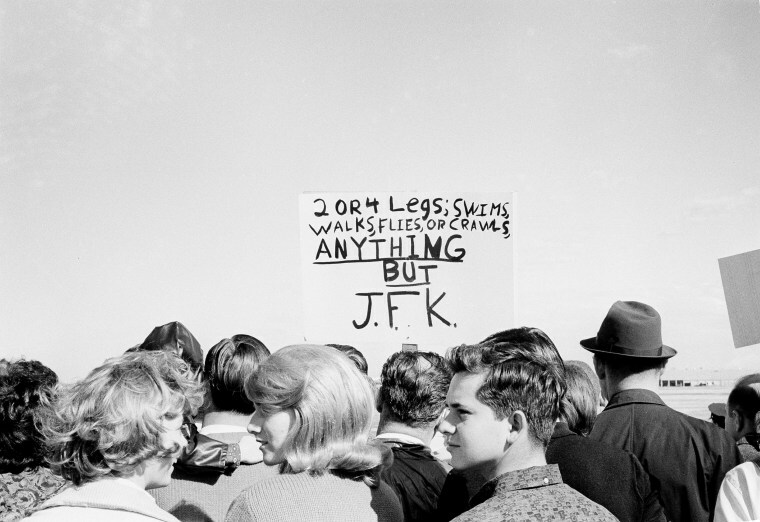 President Kennedy was shot on Nov. 22, 1963. 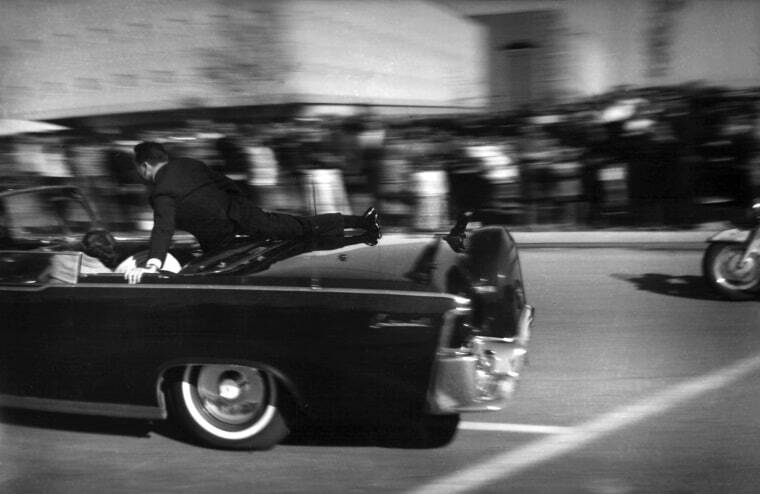 His assassination continues to be scrutinized by historians and conspiracy theorists alike. 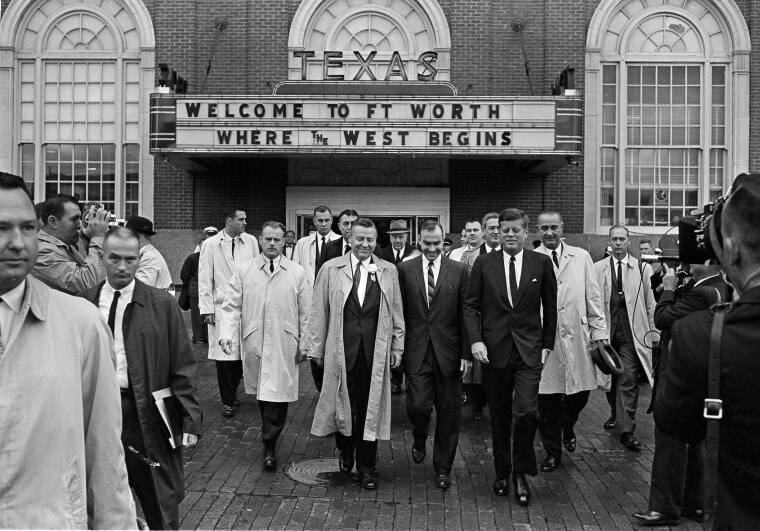 President John F. Kennedy exits the Hotel Texas in Fort Worth, at 8:45 a.m. on Nov. 22, 1963. He is on his way to greet crowds and make a speech. At right, holding a hat and wearing a raincoat is Vice President Lyndon B. Johnson. 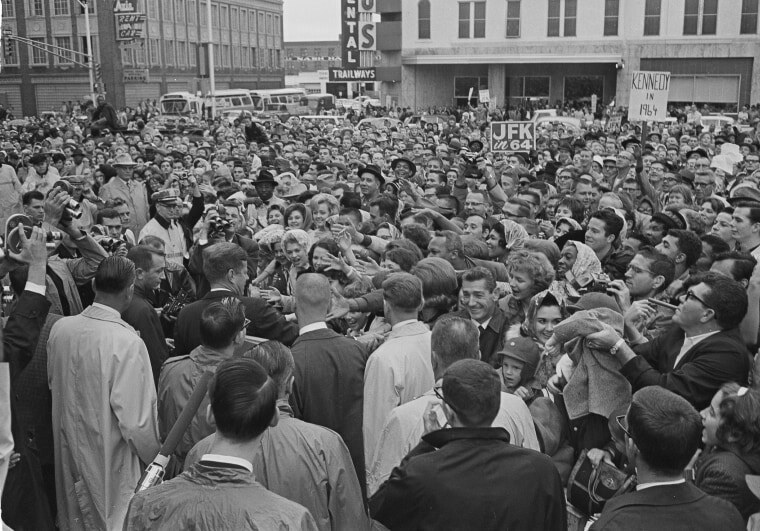 A large crowd greets President Kennedy in front of the Hotel Texas in Fort Worth. 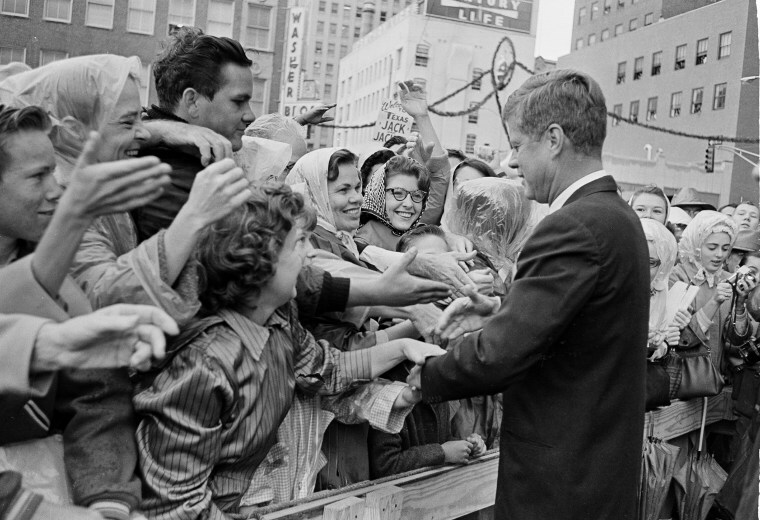 President Kennedy shakes hands with supporters in front of the Hotel Texas in Fort Worth. 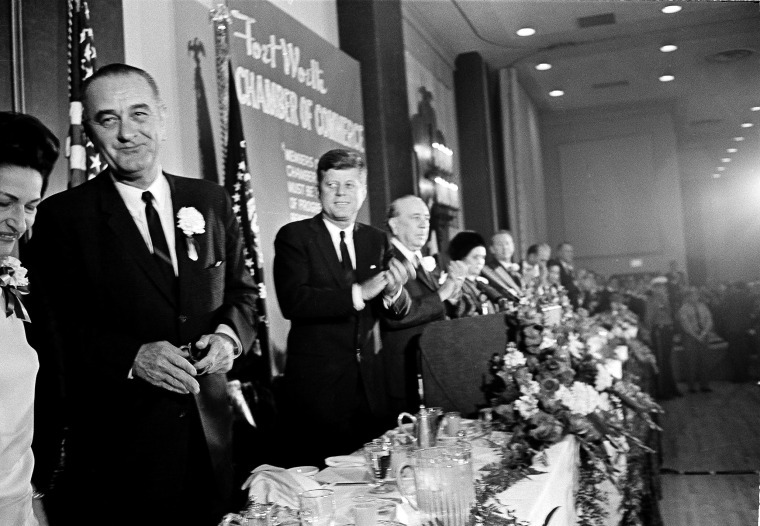 President Kennedy applauds Vice President Johnson at the Fort Worth, Texas Chamber of Commerce breakfast. The vice president's wife, Lady Bird Johnson is at far left. 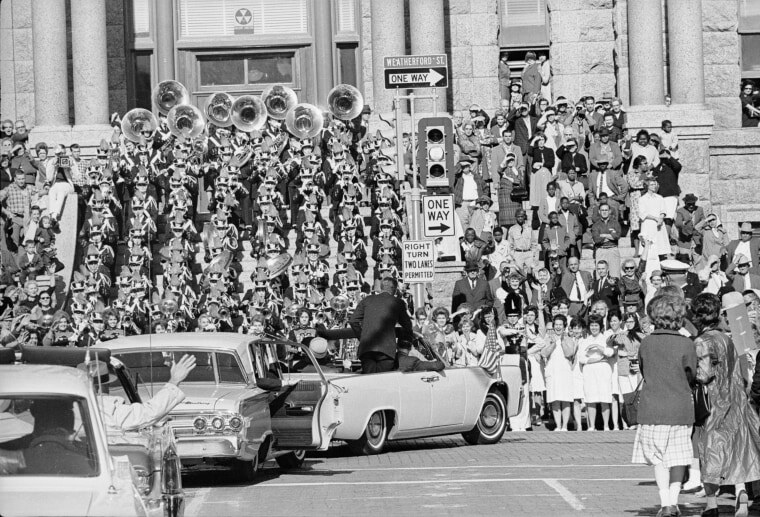 President Kennedy stands in his motorcade as it passes a brass band and viewing stand in Fort Worth. 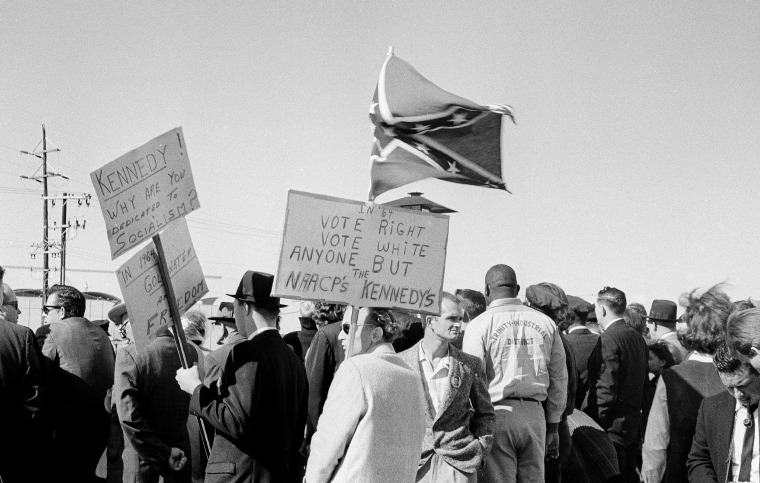 Protesters hold a Confederate flag and anti-Kennedy placards as they wait for President Kennedy's arrival at Love Field Airport in Dallas. 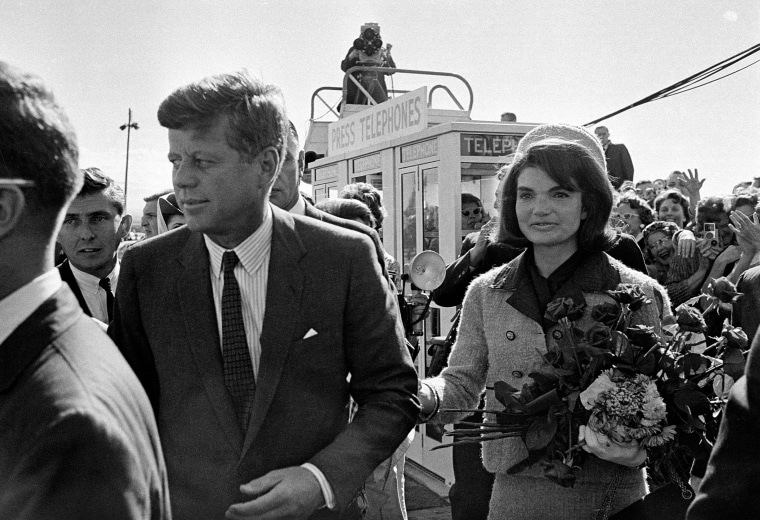 President Kennedy and first lady Jacqueline Kennedy arrive at Love Field Airport in Dallas. Protesters stand among supporters at Love Field to see the president and first lady arrive in Dallas. President Kennedy and the first lady ride in the backseat of an open limousine on Main Street at Ervay Street in Dallas as the presidential motorcade approaches Dealey Plaza. Texas Gov. John Connally and his wife Nellie are seated in the limousine's jump seats. 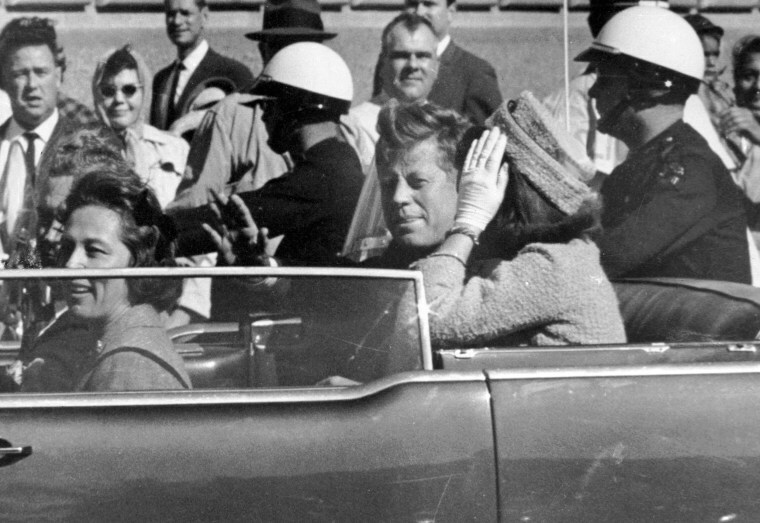 President John F. Kennedy waves from his car in a motorcade approximately one minute before he was shot in Dallas. Riding with Kennedy are the first lady right, Texas Gov. John Connally, far left, and Nellie Connally, second from left. 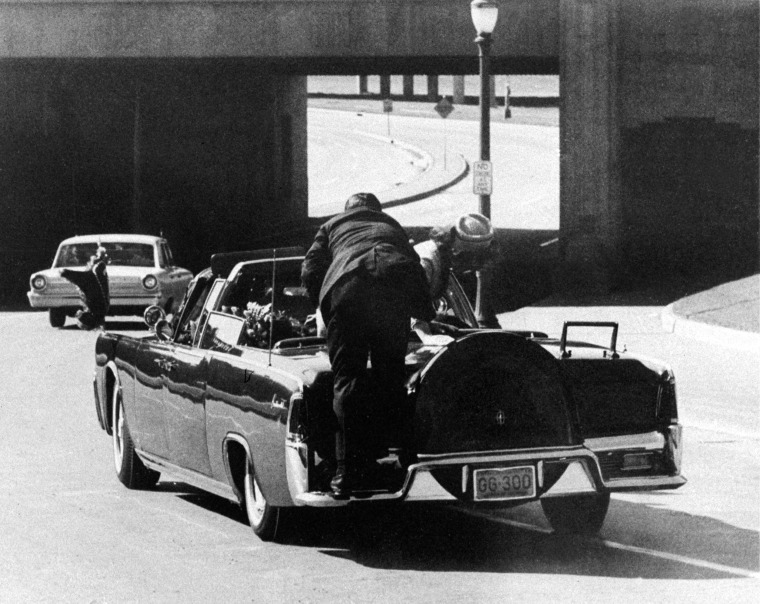 President Kennedy slumps down in the back seat of the Presidential limousine as it speeds along Elm Street toward the Stemmons Freeway overpass after being shot in Dallas. 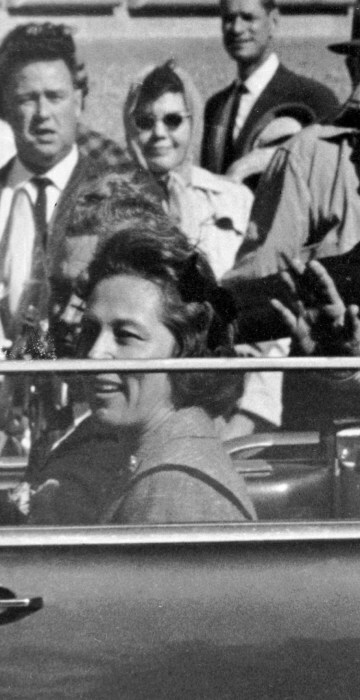 Mrs. Kennedy leans over the president as Secret Service agent Clinton Hill rides on the back of the car. 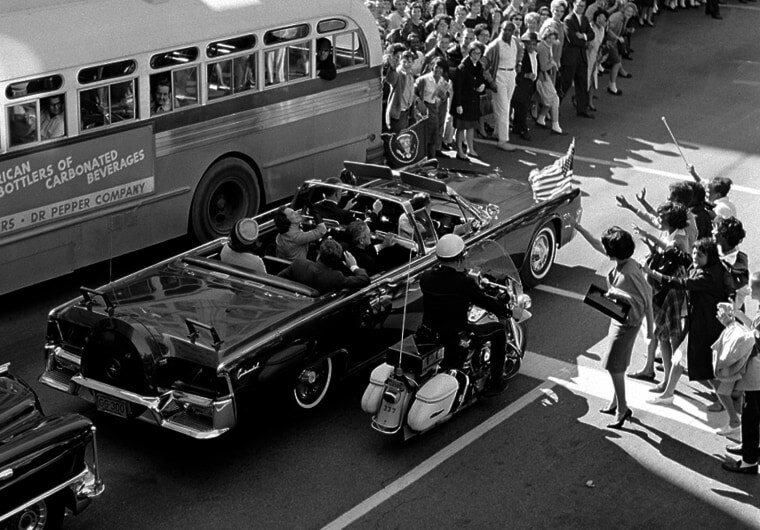 The limousine carrying President Kennedy races toward the hospital seconds after he was shot in Dallas with agent Hill on the back of the car. Mrs. Connally bends over her wounded husband and the first lady leans over the president. 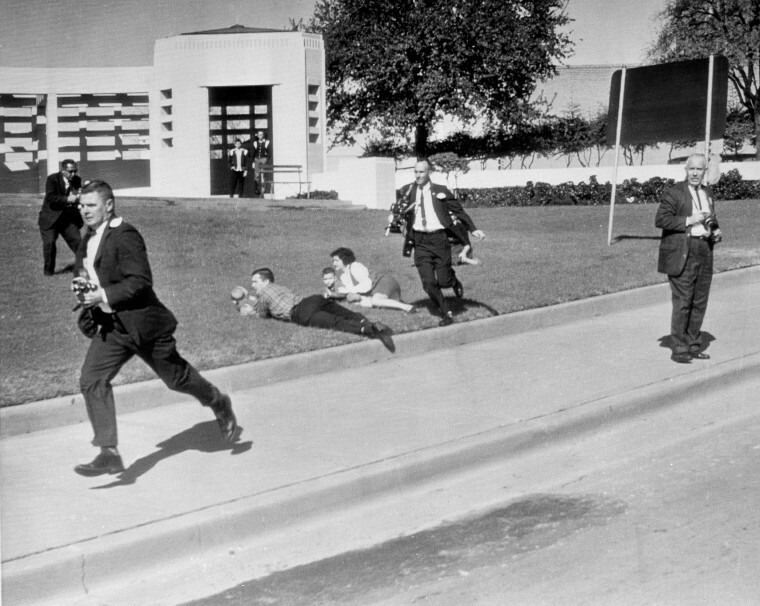 Witnesses Bill and Gail Newman shield their children on the ground at Dealey Plaza in Dallas. AP Wirephoto operator-photographer J.W. "Ike" Altgens, stands, far right. 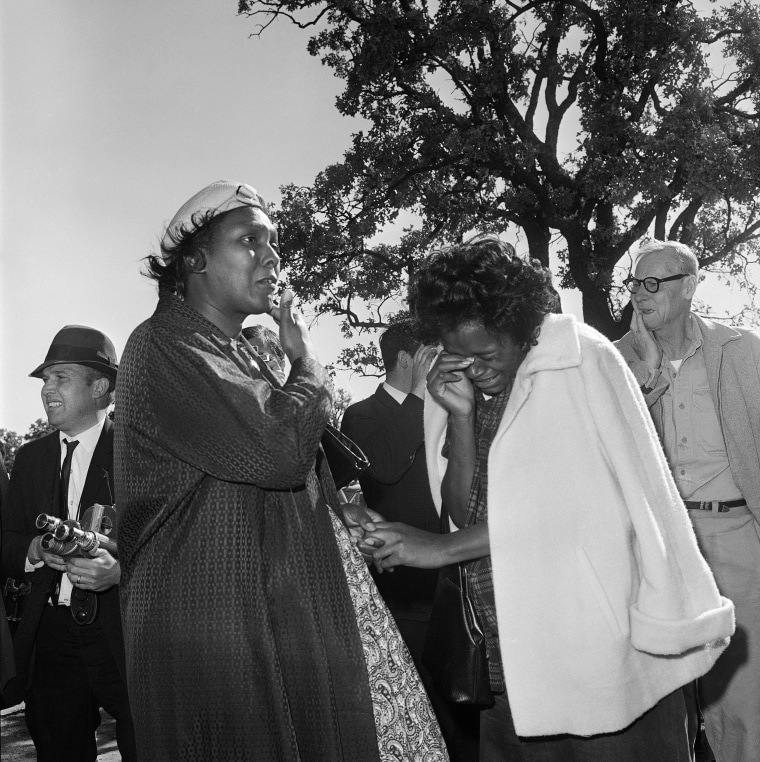 Women cry outside Parkland Hospital in Dallas after hearing Kennedy died. 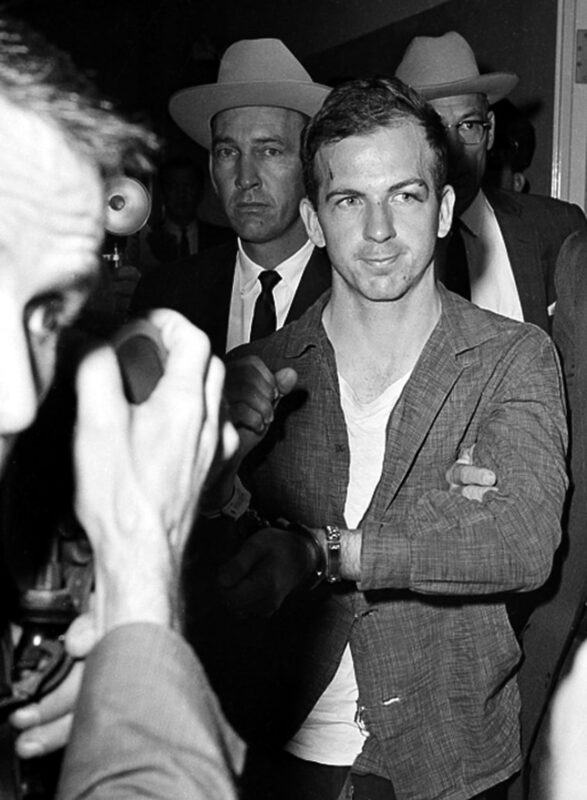 Lee Harvey Oswald at police headquarters in Dallas where he is held for questioning. 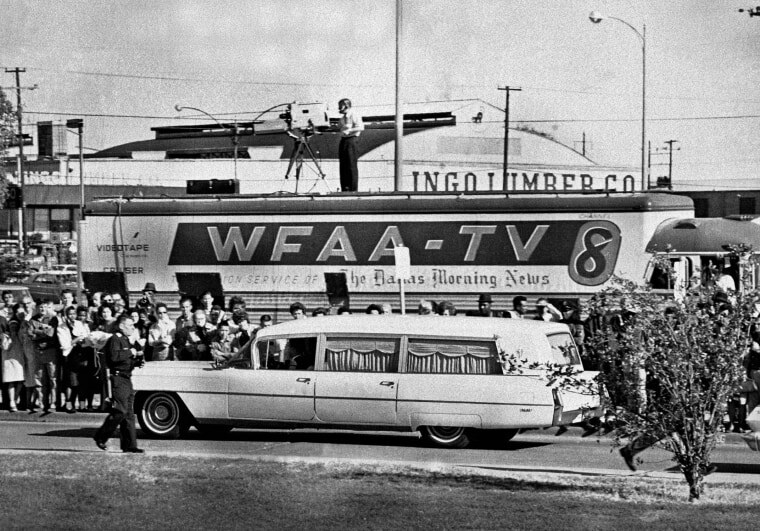 People line the street as the hearse bearing the body of President Kennedy drives past a television truck as it leaves Parkland Hospital in Dallas, to be flown to Washington. 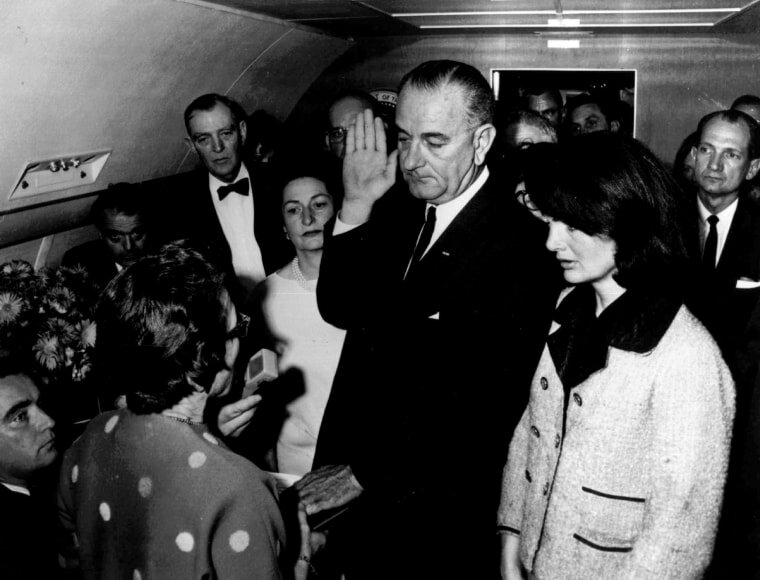 Johnson is sworn in as President of the United States of America aboard Air Force One as Jacqueline Kennedy stands at his side at Love Field in Dallas. Judge Sarah T. Hughes, a Kennedy appointee to the Federal court, left, administers the oath. In background, from left are, Jack Valenti, administrative assistant to Johnson; Rep. Albert Thomas, D-Texas. ; Mrs. Johnson; and Rep. Jack Brooks, D-Texas. The first lady, with her stockings and dress stained with blood, reaches for the door of the ambulance carrying the body of her slain husband at Andrews Air Force Base, Maryland. 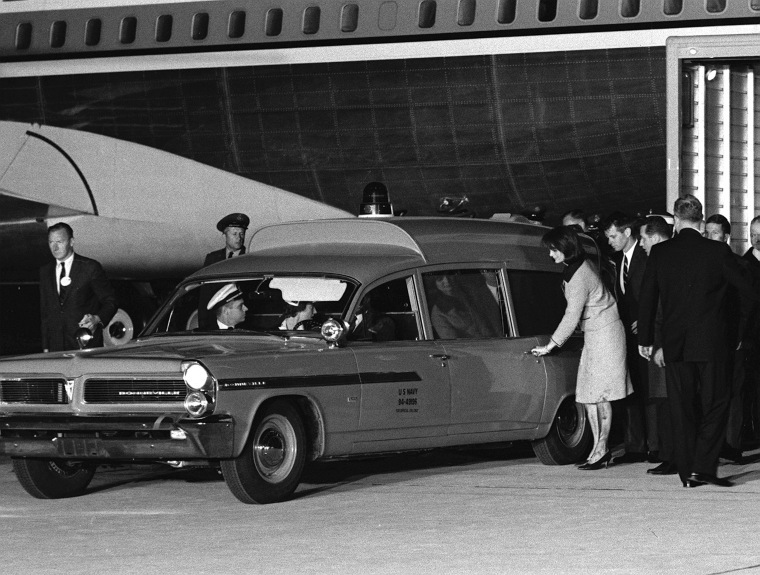 Mrs. Kennedy had just arrived from Dallas with her husband's body. The President's brother, Attorney General Robert F. Kennedy, accompanies her at right.